Fun, food, the future in the East Coast...always at your doorstep. Malvern Springs offers an unbeatable location for the discerning homeowner. It lies between the Paya Lebar and Marine Parade sub-regional hubs as well as the green hub of Kallang. Accessibility is the buzzword of Malvern Springs. It is only a 15-minute drive from the CBD, and conveniently located near several reputable schools. You are also only a stone's throw from major recreational hubs like Parkway Parade, Chinese Swimming Club, Marine Parade Community Club and East Coast Parkway, making the beach within reach. Malvern Springs is unlike any condominium. Conceived as an oasis, this sanctuary of water and lush tropical greenery nestles amidst the urban environment that is vibrant Joo Chiat. It is designed to direct your senses towards your own private paradise. This is a paradise of pools - of every shape and kind, beautiful landscaping and amenities beyond your imagination. Water is used to provide a touch of the therapeutic to heighten the sensation of resort living at Malvern Springs. Because water serves as the central focus, all living and master bedroom areas face the various pools and water features. Selected first floor apartments have the added luxury of their own private spa, off the main bedroom, and with an infinity edge to the main pool. Fifth floor units enjoy the freedom of their own spacious roof terraces. To enhance the feeling of spaciousness, the exterior and interior are brought together through the use of ful-height glass panels for the living, dining and master bedrooms. 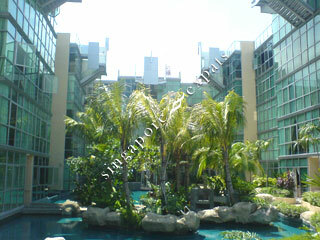 You will experience the lush landscaping and the glistening waters as if they were part of your home. Designed for everlasting comfort and enjoyment, Malvern Springs is a masterful statement of innovative planning.